Are you out on your way and forgot to carry your mirror with you? There's no worry, as you won't have to carry it any longer. Now you can switch your phone itself into a handy mirror and avoid the embarrassment to look at yourself letting people know about it. The Mirror App is available there in the Play Store. Check out how it can serve your purpose. Are you traveling or standing at a bus stop? Has something fallen into your eyes? Don't worry even if you don't have a mirror right now in your clutch. Switch your phone into a mirror and make yourself comfortable, without letting people around notice your activities. Why the Mirror App? Now that's a very petty question. If you are out there in public and feel like having a look at yourself, taking out a mirror and looking at it would be quite embarrassing. What if people don't come to know that you are looking at yourself, and at the same time you get to see if everything is fine at your end? So that's the concept behind this Mirror App, where your phone turns into a mirror and No, its NOT a Selfie Camera mode. 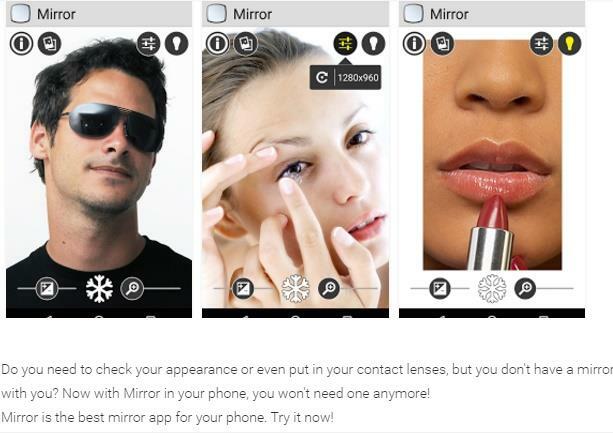 Makeup Mirror has been launched by the team of Wicked Wolf Apps which claims to be a high quality versatile mirror app presented to you Free of Cost. It is a simple to use app that shows brighter image of yours than your phone camera. It has all the standard Zoom and exposure controls. You get a Button to freeze your image for a longer time instead of clicking a photo or take all the time to view it in your gallery. The image visibility is really appreciable. Go to the Play Store on your phone, look for Mirror. It is free and it installs within seconds. Once installed open it to see your own face on the screen. Now follow the following gestures to use the app better. Drag your finger horizontally to control the exposure option. You can use your webcam and the microphone. It does work like a real mirror! You can use this app in a single tap of a screen and it solves the purpose. The app starts with showing your face, so it saves your time. In case you like your gesture or pose you can freeze it to have a look at it and then save it if it feels okay. You can increase the brightness and contrast of the screen and thus the image to get a clearer vision of your self-image. This works better than the mirror as you cannot do this in a real mirror. You can zoom in the image to get the finest vision in detail. It really helps in minute make up purpose. Within the app itself you can access all your apps as well as the phone, so, you can as well have a conversation with your contacts or receive a call while you were using this app. If you have saved your mirror images, you can immediately share them or upload them in all your social media sites, which is really awesome. Flipping from horizontal to vertical and the vice versa is all a breeze and that way you can get all the required viewpoint of looking at yourself. You don't need to unnecessarily occupy your memory space when the poses aren't correct, the Freeze and Unfreeze option is just the way it should be that allows you to check whether any of your images are worth saving. As I loved the idea and the concept of this app, I don't have much to grudge upon. But what I felt could be better, I am listing it down. The only drawback of this app in comparison to a real mirror is that, the image doesn't look at you. Your eyes focus on the screen which is not commensurate to the camera which is a little bit inconvenient to use it as a mirror. All the apps today are in trial of replacing other utility items and Mirror is really one thing which could be replaced no better way than it is done through this app. Today when Mobiles have become almost a part of our body, using it up as a mirror is simply a brilliant idea, that has involved good thoughts of real life situations and its solutions. Now with a mirror in your mobile you can reduce the weight of your handbag. 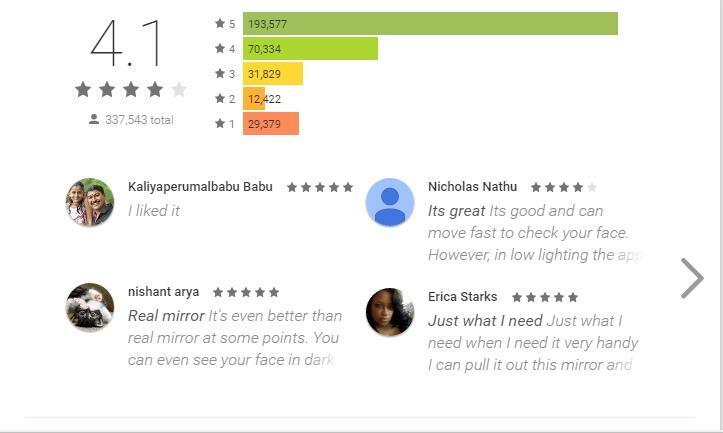 To sum up "Mirror" as an app is a boon to the Women Community. But there's nothing to feel embarrassed if men use it to avoid untoward situations, as its all within his mobile.